A 34-year-old man with chronic anterior knee pain underwent MRI after a radiograph of the left knee demonstrated no acute or significant degenerative findings. Sagittal and axial short TI inversion recovery (STIR) images (A and B, respectively) demonstrated increased signal at the superolateral aspect of the infrapatellar fat pad (solid arrows), and the Insall-Salvati ratio (C, dashed line/solid line) was 1.4. Chung CB, Skaf A, Roger B, et al. 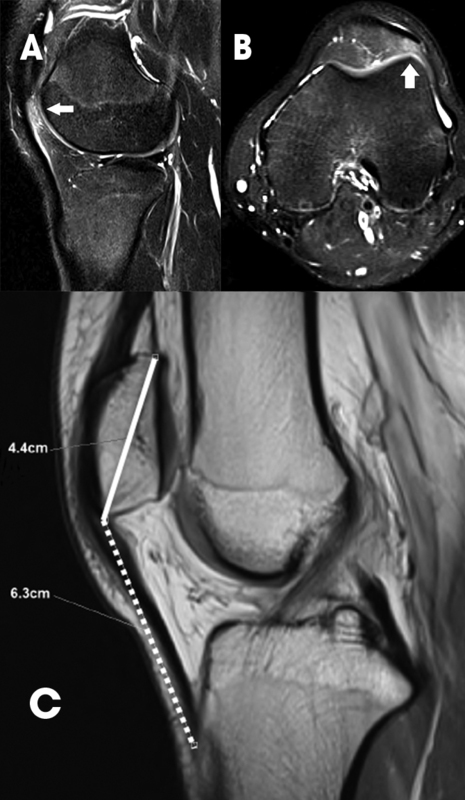 Patellar tendon-lateral femoral condyle friction syndrome: MR imaging in 42 patients. Skeletal Radiol 2001;30(12):694-697. Bergman AG, Fredericson M. MR imaging of stress reactions, muscle injuries, and other overuse injuries in runners. Magn Reson Imaging Clin N Am 1999;7(1):151-174. Bautista L, Mostert P. JAOCR at the Viewbox: Patellar Tendon-Lateral Femoral Condyle Friction Syndrome. J Am Osteopath Coll Radiol. 2018;7(3):33.